When I moved into my first apartment before my senior year in college, my mom taught me how to roast a chicken. She thought it would be practical because, you know, you can make so many different things out of roast chicken. Needless to say, I never roasted a chicken that year or in any of the years that have happened since then. Until Saturday, when I decided to roast a chicken for no reason other than it seemed like a good thing to do on a mid-winter weekend. We all know that Ina Garten is the queen of roast chicken, so obviously I had to use this Barefoot Contessa ‘Perfect Roast Chicken’ recipe, which turned out to be super easy. Anyway, I went home with all of my little groceries and got to preparing the chicken, which was pretty horrifically unpleasant as I cook meat maybe twice a year. I washed my hands approximately seventy-eight times while I was washing, salting, peppering and stuffing the chicken. (And I also Cloroxed everything I could have possibly touched in the kitchen.) 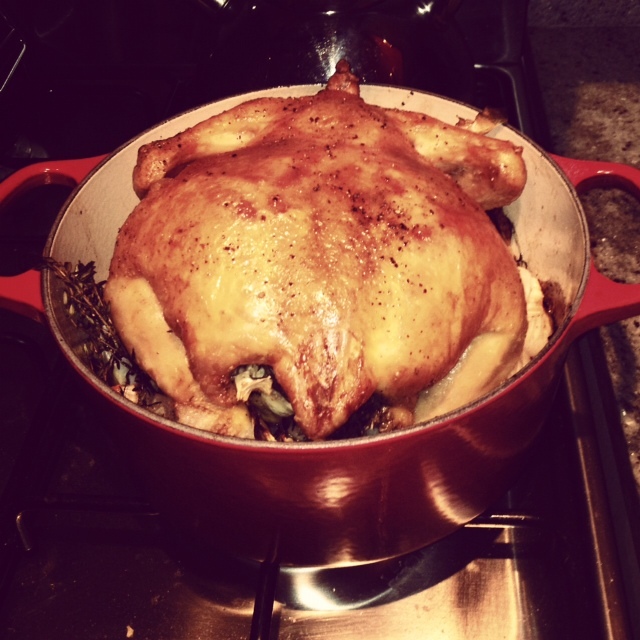 By the time I had it all stuffed, my friend Vincent had gotten there and he helped me nestle the chicken in my roommate’s adorable Le Creuset dutch oven that we had filled with all of the vegetable that Ina suggested in the recipe. And then we ate the chicken and it was delicious and we didn’t get food poisoning. But the leftovers are still sitting in the dutch oven in my refrigerator because leftovers – especially leftover poultry – kind of freak me out because I’m still afraid of getting food poisoning/diseases of any kind/turning into a chicken during the night. I read this in your voice. It was amazing.